Dr. Li has been assuming the role of a research engineer III from May 2014 at the Center for Integrated Petroleum Research (CIPR). Before that, he had served as a research scientist III from Dec. 2012 to Dec. 2013 at Numerical Porous Media Center, KAUST, KSA. He had independently proposed the DSBGK method to efficiently and accurately solve the BGK equation and developed the MPI Fortran software NanoGasSim using the DSBGK method for the study of shale gas permeability and gas flows in MEMS at high Knudsen (Kn) number. Ph.D., Fluid Mechanics, Institute of Mechanics, Chinese Academy of Sciences, 2009. M.S., Thermal Energy, and Power Engineering, Tsinghua University, 2006. Thermal Energy and Power Engineering, North China Electric Power University, 2004. Monte Carlo molecular simulations of shale gas at pore-scale; LBM simulations of two-phase flows in porous media at pore-scale and turbulence; MCMC molecular simulations of phase-coexistence properties of mixtures; and Fortran MPI software developments (e.g. NanoGasSim). Jun Li, “Efficient prediction of gas permeability by hybrid DSBGK-LBM simulations,” Fuel, 250: 154-159, 2019. 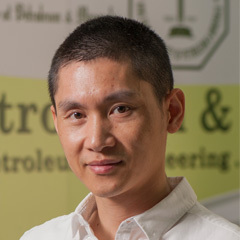 Minh Tuan Ho, Jun Li, Lei Wu, Jason M. Reese, Yonghao Zhang, “A Comparative Study of the DSBGK and DVM Methods for Low­-speed Rarefied Gas Flows,” Computers & Fluids 181:143-159, 2019. Jun Li, Donald Brown, “Upscaled Lattice Boltzmann Method for Simulations of Flows in Heterogeneous Porous Media,” Geofluids, ID 1740693, 2017 (invited). Jun Li, Victor M. Calo, “Phase-coexistence Simulations of Fluid Mixtures by Markov Chain Monte Carlo Method Using Single-Particle Models,” Journal of Computational Physics 249: 233-248, 2013. Jun Li, “Comparison between the DSMC and DSBGK Methods,” arXiv:1207.1040 [physics.comp-ph], 2012. Best Poster at the 4th TU-SNU-UT Joint Symposium, Univ. of Tokyo, March 12-13, 2010.